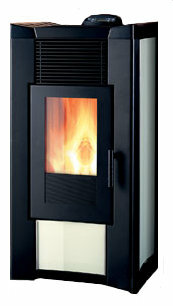 The Ecoteck Ilaria is a very modern looking pellet stove with extremely clean design lines. In its black steel body, the Ilaria uses light coloured glass panels at the front and sides. Glass colours available are white, silver and cream. The stove top is in black majolica. The Ilaria produces 44,000 btu., enabling it to heat up to 1,800 square feet of space at over 85% efficiency. Remote control, GPRS text message control and a wall thermostat are available as options. The seven day programmable timer thermostat is supplied with the stove as is the FIREX 600 combustion chamber. Heating Area 1,800 sq. ft.
Max. Heat Output 44,000 btu. Min. Heat Output 8,500 btu. Convection Blower Capacity 194 cfm. Window Size 14 in. by 10 in. Rear Vent Height 13.8 in. Construction Type Fabricated steel with glass front and side panels, majolica top. Three years on manufacturing defects providing the stove has not been misused or installed wrongly. Not covered: Firex 600 combustion chamber, door glass, gaskets, burn pot, igniter, paint finish and cast majolica. The Firex 600 combustion chamber and the Majolica panels are ceramic and vulnerable to breakage through careless handling, strong detergents and abrasive cleaning products. Daily: Clean the burn pot and the heat exchanger. Every two or three days: Clean the grill around the burn pot, the stove glass, empty the ash pan and vacuum the combustion chamber. Yearly: Clean the flue, check the door gasket. If you would like to leave a review of the Ecoteck Ilaria pellet stove, please use the form on the contact page.